Suzanne Collins, the author of the book, The Hunger Games, on which this movie is based, reportedly said that the idea came to her when she was switching channels between a reality show and the Iraq invasion - "the two began to blur in this very unsettling way". Although the genre lies somewhere between science fiction and young adult literature, The Hunger Games will find more takers in the older generations - the ones who disapprove of the bastardisation and commercialisation of human emotions on the small screen. The movie, The Hunger Games, is set in an indefinite era some time after the destruction of North America, in a nation named Panem. About 75 years ago, the 13 districts of Panem had revolted against the authoritarian government. The rebellion was crushed, but an entire district was lost. To remind the now-subdued citizens of their "mutiny" and to ensure that it is never repeated, the authorities pick, through a raffle known as the "Reaping", one boy and one girl between the ages of 12 and 18, from each of the 12 districts, for the annual Hunger Games. The kids are pitted against one another in a game of survival, and only one can make it out alive. 16-year-old Katniss Everdeen (Jennifer Lawrence) is like a mother to her younger sister Primrose (Willow Shields). 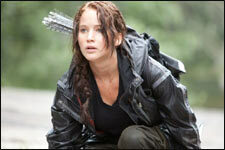 They live in the coal mining District 12 - a poverty-stricken region, and Katniss runs the household. 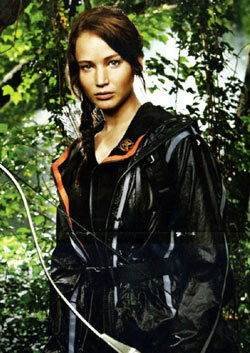 When Primrose's name is announced in the raffle, Katniss volunteers to go in her stead. Her male companion is Peeta Mellark (Josh Hutcherson). Their mentor is a drunken Haymitch (Woody Harrelson), once the champion from District 12. Effie (Elizabeth Banks) is their chaperone, and Cinna (Lenny Kravitz) is their stylist. As the duo trains for the upcoming championship, they come to understand the bloodthirsty mob mentality of big cities, and how to play to the gallery. They also realise that their biggest threat comes from the contestants, or tributes, of the affluent and brutal Districts 1 and 2. Needless to say, the movie is a commentary on the popularity of reality shows in present times. Viewership increases only when stakes get higher, and television companies laugh all the way to the bank, even as brother turns against brother and cold-blooded ambition and ruthlessness are endorsed as admirable qualities in a teenager. The Hunger Games just take it a step ahead by including blood and gore as entertainment - a logical upgrade from all the fighting and name-calling that we now see on our television sets. The Hunger Games is not preachy, however. In fact, the only reason it may not become a box-office hit is its somewhat ambivalent narration, and of course, the length (approximately two-and-a-half hours). Also, the underdog may not garner too much sympathy and support, because she becomes really smart at what she is doing, very quickly. The melancholic, selfish Katniss could not have been portrayed better by anybody else. Jennifer Lawrence, last seen as the vulnerable Mystique in X-Men: First Class, does a wonderful job of being distant yet fiercely attached to her sister. And can she run! Josh Hutcherson, who is a well-known face from movies such as Journey To The Center Of The Earth and The Bridge To Terabitha, is quite a treat. He evokes compassion and sympathy as he is suddenly thrust into an alien, ferocious world. Wes Bentley, with his ridiculous facial hair, looks suitably psychotic and confused as the gaming director. The benign-looking Donald Sutherland plays the part of a manipulative President, to the tee. Stealing the show, however, is Stanley Tucci as the television host, Caesar Flickerman. He is cold, calculating, sympathetic, sarcastic, friendly, and a whole lot of other things, all at the same time. The production design and costumes are largely inspired by the 1980s. Every man is dressed like David Bowie, and every woman is Cyndi Lauper. Loud, fluorescent colours are the norm in the Capitol, complete with gold eye-shadow for men - all this is symbolic of the decadence that the civilised society endorses. The villages and outlying areas are straight out of the middle ages, and the desperation and depression lend themselves to the dull colour palate of the unfortunate population. The author of The Hunger Games trilogy has very smartly used children to portray the depravity in our world today, and the director of the movie has just added visually to her message. Despite the not-so-clear agendas of certain characters in the movie, and the feeling of an incomplete climax despite its length, The Hunger Games deserves at least one watch, for the social message, if nothing else. Be the first to comment on The Hunger Games! Just use the simple form below. fullhyd.com has 700,000+ monthly visits. Tell Hyderabad what you feel about The Hunger Games!